Many of the camera systems I have used over the last 2+ decades have been either custom made or modifications to older systems to “fit” newer capture devices. If the option of custom lens mounts, custom lens caps and complete from the ground up camera systems is new to you then give a listen to this audio blog (click on the AUDIO logo) recorded December 2007 with Adam Dau of S.K. Grimes. 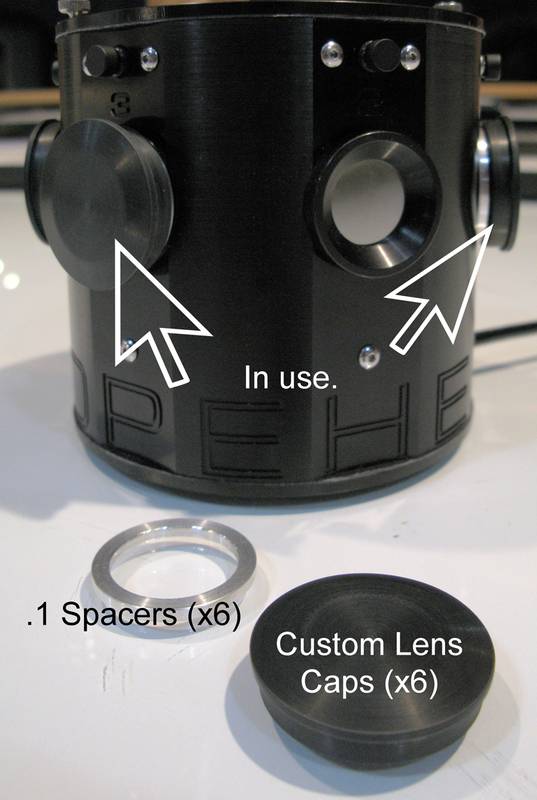 I have also posted (below) an image of my Hexomniscope Camera by Abelson Scope Works with its newest custom accessories…custom made lens caps (or perhaps I should say Pinhole Caps) and .1 spacer rings to allow different controlled positions for the pinhole made for me by Matt Abelson of Abelson Scope Works. For me and my works the OPTION of custom configurations and accessories is essential as I find the out of the box systems and accessories most companies offer miss the mark time after time. Also, stay tuned for an exciting audio interview posted early next week with Matt Abelson of Abelson Scope Works.